There has been a lot of heated discussion recently around the Kermadec Ocean Sanctuary. So much so, it’s easy to lose track of why the Sanctuary is so important. The Kermadec Islands and the surrounding oceans are one of the most special and pristine marine environments in the world. They are home to an amazing array of wildlife, much of which is found nowhere else on the planet. Whales, dolphins, sharks, albatrosses, petrels, turtles, deep sea corals and unique vent creatures all have a home in this incredible place. And science is just scratching the surface of what lives in the area - there are estimated to be thousands of species waiting to be discovered. Protecting the Kermadecs is so important because it is one of the very few areas of ocean on the planet that is relatively untouched by humans. This means scientists can study how an intact ecosystem works. We cannot lose sight of how important this area is in the current debate about the Sanctuary; we have an obligation to future generations to protect this diverse and sensitive region. It’s also important to remember that the Kermadec Ocean Sanctuary has not come ‘out of the blue’; it has been worked on and supported for years by New Zealand NGOs, the Green Party, mana whenua, the Labour Party, artists, scientists, thousands of New Zealanders and now the New Zealand government. It’s really disappointing that commercial fishing interests are now trying to frame the debate as being about Maori opposing the Sanctuary. The reality seems much more complicated with genuine anger about consultation being conflated with opposition to the Sanctuary itself. The iwi connected to the Kermadecs, have expressed their support for full protection of the Kermadec region and will co-govern the Sanctuary. Future generations of New Zealanders will be in debt to them for their foresight and tangible expression of kaitiakitanga. WWF-New Zealand disagrees with the claim by Te Ohu Kaimoana (TOKM), representing commercial fishing interests, that the Sanctuary wrongly removes fishing rights. TOKM has used the analogy of a vacant lot of land that they own and are waiting to develop, and that this ‘future development right’ is being taken away by the government. But the Kermadec region is not a vacant lot. The fishing industry does not have exclusive rights over the Kermadecs or any other part of the oceans. The industry has the right to catch a certain amount of fish, subject to a range of regulations to protect fish stocks and the health of our oceans. The Kermadec region, comprising about 15% of New Zealand’s ocean environment, accounts for just 0.004% of the value of New Zealand’s fish catch. TOKM’s ‘future development right’ argument is that the Sanctuary should be stopped, or they should be compensated, because there might possibly be commercially viable fisheries there one day. Our concern is that this ambiguous concept could then be applied to the creation of marine reserves anywhere, effectively putting a brake on marine conservation. In any case, the migratory fish that are caught in the Kermadecs can be caught outside of the Sanctuary, and that will be the case in the future too. If these migratory fish stocks become better managed and allowable catches increased, the fish can be caught in other parts of New Zealand’s massive ocean environment, so no rights to catch more fish have been lost. That is not to say there are not genuine concerns around consultation and engagement. There are lessons for all of us to learn from this - we need a framework that involves Maori and gives all stakeholders a chance to have a say when protected areas are being developed, especially the iwi who have the mana over an area. There is an opportunity right now to create a robust process with the broader marine protection legislation currently being developed by government. WWF-New Zealand believes that protected areas, like the Kermadec Ocean Sanctuary, are a vital part of good ocean management and help look after the environment on which the fishing industry depends. We had hoped our fishing industry would stand proudly behind this initiative that underscores New Zealand’s credibility as stewards of the seas. As a nation, let us have a dialogue about how best to look after our oceans and ensure our important fishing industry flourishes. But that should not stop us protecting the amazing area around the Kermadecs. It has been great to see the National Party, mana whenua and the Green Party showing leadership on this issue. We would love for all our political parties to come together to help create the Kermadec Ocean Sanctuary; that would be an amazing achievement for our country, and something that we could all be proud of. Green turtles (Chelonia mydas) swimming. 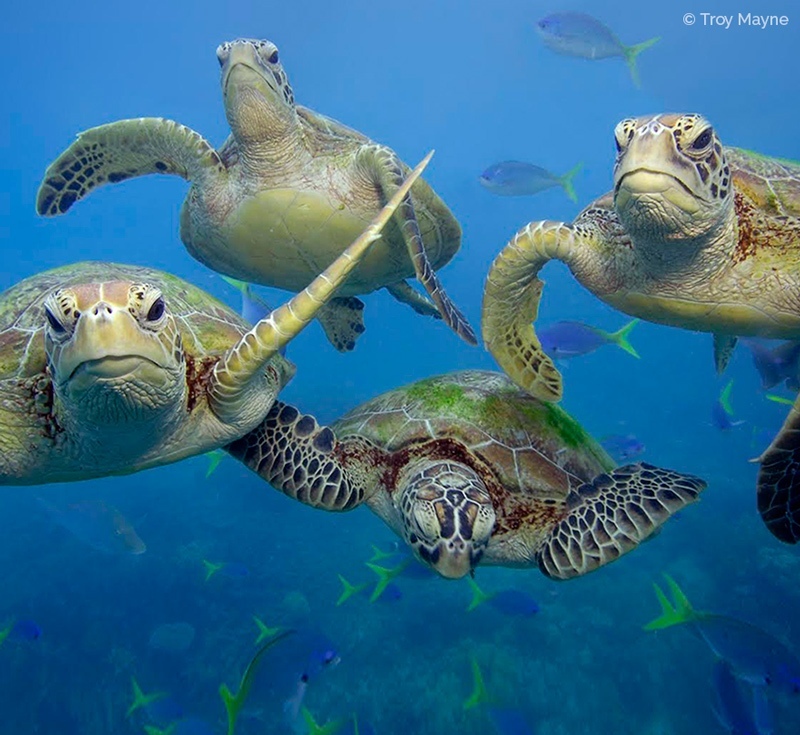 Three of the world's seven sea turtle species are found in the Kermadec area (hawksbill, leatherback and green turtles). They are all endangered or critically endangered.